As professional training and instruction moves online, subject matter experts, in-person instructors and offline trainers are facing new obstacles as they reinvent their offline content. 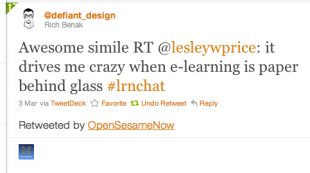 As Lesley Price noted on Twitter on Monday, your elearning resources won’t succeed if they’re just “paper behind glass”: they need to be more than your old paper resources or lecture notes in a new format. Author Natasha Terk recently adapted the contents of a grammar book she wrote into an elearning course for sale in the OpenSesame elearning marketplace, “Just Commas: A Write It Well Guide.” Terk kindly agreed to talk with us to share some of the lessons learned from her experience adapting static content for a self-paced elearning course. What made you decide to adapt your content into an elearning course? Our company wrote this book in the 90s but it was out of stock. We already owned the copyrights. It needed to be reprinted so we were either going to spend money with the print house (and then manage all the other associated costs and work to store, ship, and fulfill orders) or repackage it for the 21st century. What were the main changes you made? How long did it take you? We trimmed some of the learning content and moved or removed a number of examples and exercises so that the whole program moved faster. This was one of our first (completely in-house) projects so we had to invest some learning time. It took a couple months to turn a flat, boring book into a fully interactive, -compliant, engaging e-learning module. What are some of your lessons learned? Make it bite-sized. I’m really interested in offering comprehensive business writing courses, but a lot of the audience wants short, focused segments like ‘effective e-mail subject lines’. Keep it moving fast. People complain more when training is too slow than when it’s too fast. Resist the urge to cut and paste all your text or lecture notes. Focus on the crucial information. You don’t have to spit out every bit of context in an online course, if you ensure that your learners have the social networks and access to resources to find further information and support on their own. Don’t spend too much time on “How to do it” before you move to “You try doing it”! It’s an elearning course. A learner can replay the core content as many times as they like, so as long as you’ve provided the basic information well. Let the learner drive the experience. Think about providing branched scenarios to better meet the needs of a specific learner. Any more tips from the elearning community?